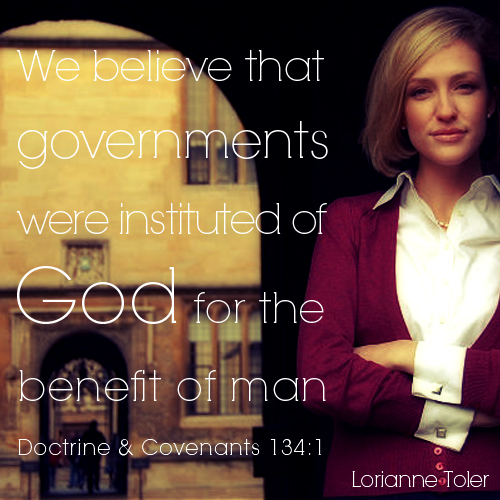 "Lorianne Toler: Mormon Woman Building a Constitution for Libya "
Lorianne Toler’s career has not gone quite the way she planned it. She graduated from Brigham Young University’s J. Reuben Clark Law School and while there, she set up a non-profit organization called Constitutional Sources Project (known as ConSource) to digitize every document related to the founding of the United States Constitution. She dreamed of writing constitutions, but the United States already had one and there didn’t seem to be any other countries putting one together. Besides, she was young and without experience, so she doubted anyone would be interested in letting her help. Then Toler, who is a member of The Church of Jesus Christ of Latter-day Saints (which church is often inadvertently referred to as the “Mormon Church”), started watching as Arab Spring began to change the Middle East. She changed her major to comparative constitutionalism out of a desire to be able to help in situations like this. The changes in Libya particularly interested her because she felt there was a greater chance for democracy there. Toler received an unofficial invitation from a small number of employees in the Libyan government to meet with them in Tripoli. The United States State Department discouraged her from going, but she went anyway. She had studied constitutions from around the world dating as far back as two hundred years, further than the more traditionally studied span of fifty years. She didn’t go to write their constitution for them. She believes that if they write their own constitution, with input from citizens, it is more likely to be accepted. She took on the role of introducing them to constitutional processes that were successfully used by other countries so that they could select a process likely to be accepted in their own country. She has written some articles for their media that explain this process. Next, she hopes to help them put together a coordinating body consisting of leaders in government and civilian life. Toler has reduced her consulting work to fifteen hours a week in order to give her more time to take care of her newborn son. She says that she and her husband waited a long time for this baby and she wants as much time with him as she can get. She has put her doctorate on hold. Read more about Lorianne Toler’s work in Libya. In 2010, Toler garnered national attention when she found an early draft of the Constitution in Philadelphia. (See Edward Colimore, Early Draft of the Constitution Found in Phila, The Inquirer, Feb. 2, 2010.) Found in a vault at the Historical Society of Pennsylvania, it contained a full draft of the Constitution. On the backside, however, was a shorter version. The handwriting was that of James Wilson, one of the signers of the Constitution. His writing of it ended abruptly and she suspected pages were missing. She found the remainder in the same vault. While that portion was known, it had not been placed with other similar documents. It actually constituted the third document in the set.